The EHF EURO 2010 will enjoy world-wide coverage. Zug, Switzerland / Vienna, Austria, 18 January 2010 – The start of the 2010 EHF European Handball Championship (EHF EURO), running form 19-31 January, will feature the most comprehensive global media and marketing programme implemented by Infront Sports & Media, the exclusive commercial partner for the European Handball Federation’s (EHF) premier event. The tournament is taking place in Austria, bringing together Europe’s best men’s handball teams. The line-up includes established handball countries from Scandinavia (with defending champion Denmark), France, Germany, Poland, Russia and Spain, as well as successful teams from upcoming handball nations such as Croatia, Hungary and Serbia. The 47 games will be played in five host cities Graz, Innsbruck, Linz, Wien and Wiener Neustadt. Infront’s longstanding relationship with the event is a strong one and the company will deliver worldwide coverage, including dedicated live online coverage on www.ehf-euro.com, the official website of the event, and a comprehensive marketing programme. Distribution of the media rights for the Championship has been very successful. Infront concluded agreements for close to 70 territories – in Europe, Middle East, Asia and South America – and the event will be transmitted by around 70 television and radio stations. Most of these broadcasters will provide live or near-live transmissions, depending on the time zones and broadcaster schedules. In addition, there is a high level of news access coverage. News access will be available worldwide through broadcast partners with international television stations, such as Reuters and Deutsche Welle TV. The host broadcasting for 2010 EHF EURO, overseen by Infront and being carried out by Austrian public broadcaster ORF, will provide a state-of-the-art multi- and unilateral broadcast production. This includes filming and transmitting a high quality signal, as well as supporting broadcasters in their unilateral production, transmission and commentary facilities and services. The production will include up to 15 cameras per game, including state-of-the-art Tower Cameras behind the goals and additional ceiling mounted Hot Head Cameras. All games will be covered and distributed in wide-screen 16/9 format with adapted and animated on-screen graphics. Infront has increased the television coverage and audience figures over the past 10 years. The 2008 men’s and women’s events together achieved a total cumulative television audience in excess of 1.5 billion, with a total of more than 2,000 hours of programming. 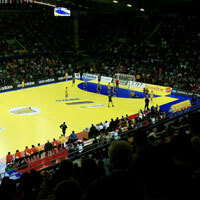 The January 2008 men’s event in Norway had more than 1.2 billion viewers, which also set a record for a single EHF EURO event. It was the most extensively covered and viewed tournament in the history of the competition. Overall, the tournament was broadcast with 1,100 programme hours. The official website, www.ehf-euro.com, will again be jointly produced by the EHF and Infront. This platform offers fans extensive information about the event, participating nations, players and live game statistics. The coverage of the EHF EURO 2010 will be highlighted by a dedicated online broadcast service. The complete schedule of all games will be offered Live and On Demand. Fans can choose between 500 Kbit/s and 1.5 Mbit/s (close-to-television quality) of video stream. Prices for the service range from €3 for a single game to €18 for the entire live Tournament Pass (47 games). The marketing programme for the EHF EURO 2010 has been developed to provide enhanced visibility, perimeter and board advertising, on-floor signage, branding on referees’ shirts, media backdrops and promotion stands. The program also includes VIP hospitality services. The Official Sponsors include eight international and regional companies and brands: AJ (Home and office furniture), Appel Feinkost (Delicatessen), bet-at-home.com (Betting services), Grundfos (Pump solutions), Henkel (Consumer Products), Mekkonomen (Car parts retailing), Spar (Food retailing) and Vola (Brassware design). Infront Sports & Media’s relationship with the EHF dates back to 1993, when the Swiss-based sports marketing group took over the responsibility for both the television distribution and marketing of the European Handball Championships (EHF EURO) on a worldwide basis. In June 2009 the EHF and Infront have agreed to extend their current long-term marketing partnership in until 2020.